There are so many individual things wrong with Netflix’s live-action Death Note film that you might as well roll dice to figure out where to start. Here’s one: it’s just not enough pounds in too small a bag. You can’t take even a modest sample of all that was interesting and thought-provoking in the original manga and cram it into a movie. Not a two-hour movie, and definitely not a hundred-minute movie. This isn’t Death Note; it’s barely Cliffs Notes. But there’s a lot more that’s wrong. And perhaps the biggest is that it embodies one of the basic sins of all anime/manga-to-live-action productions: Don’t be laughable. If this is what we can expect from the next wave of anime and manga remakes outside of Japan, kindly include me out. Let’s settle one issue right away. Whitewashing wasn’t the problem here, at least from where I sit, because I didn’t have an inherent objection to moving Death Note to a Western setting. In fact, Death Note was one of the properties I thought had a better-than-average chance of surviving such a move. The basic premise was open-ended enough to work most anywhere. A bright and idealistic young man, appropriately named Light (here, Nat Wolff), comes into possession of an unearthly artifact that allows him to essentially kill by remote control, courtesy of a demonic being named Ryuk (Willem Dafoe [voice]/Jason Liles [body]). Light trades his idealism for the role of self-appointed despot of world peace, enlists his would-be girlfriend in the mission (Margaret Qualley), and plays Moriarty to a Sherlock Holmes, another young man codenamed L (Lakeith Stanfield). Death Note 2017 keeps the basic elements, but can’t figure out whether to present them as low camp, middlebrow drama, or genuine horror. Imagine if three different directors shot three tonally discordant versions of the same story, and the editor tasked with stitching together a finished version wasn’t allowed to speak to any of them. I don’t object either to the idea that a remake or relocalization can depart from the original, but it has to do so in ways that honor the material. The biggest way DN’17 breaks that promise is by giving us characters that share the names of their counterparts but not much else. The original Light was something of a goody-two-shoes idealist, and much of the drama stemmed from seeing how far someone like that could fall, how fiercely he could continue to justify it, and whether or not he could keep up the charade indefinitely. Here, Light’s more of a frustrated-idealist problem kid, disgusted with how the system has failed him in re his mother’s killer. When he’s busted for hocking correct homework answers for cash, his reply is: How can people think what he does is criminal, when the real criminals are walking free? It’s not that it takes Light’17 relatively little time to start picking out targets for extermination once the Death Note (literally) falls into his hands. The anime didn’t bide its time, either. It’s that Light’17 doesn’t really seem to have all that far to fall in the first place, and so he’s correspondingly less interesting to watch in his machinations. I actually had something of the same problem with Jack Nicholson’s character in The Shining: he’s so obviously on the brink from the start, his descent into madness telegraphed ahead of time so transparently, that it all seemed a foregone conclusion instead of a gradual seduction into evil. Death Note 2017 tries to make up for this by offloading some of the slide-into-evil to Light’s purported girlfriend, Mia. She, too, is abridged greatly from the original. There, she was a chirpy teenybopper celebrity who formed a kind of love affair of the damned with Light, and turned out to have Note-related powers of her own that significantly altered the balance of power between them. Here, she’s a cheerleader who realizes killing the deserving by way of the Note is a far more interesting way of life than just waving pompoms, and eventually she asserts enough controlling interest in the project to make Light nervous about who the real brains in this outfit might be. It’s not a bad idea in the abstract, but it’s torched where it stands by the movie’s inability to pick and establish a tone. 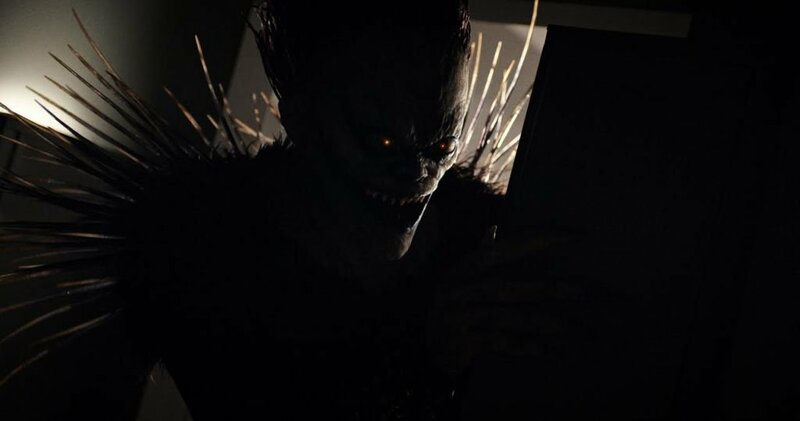 And then there’s Ryuk, the otherworldly Mephistopheles who provides Light with the note, tutors him in its use, and eggs him on to do world-changing things with it. He’s been ported more or less intact, down to his character design and his vile smile. It helps that Dafoe is a perennially favorite actor of mine, but Ryuk’s role is more Greek chorus than instigator, and is ultimately there to be used as a source of plot misdirection. He’s fun to watch, but that’s not enough to offset all else that’s wrong. Where it all goes wrong, again, is by way of a twofold synergy. The movie’s inconsistent tone produces bad decisions about how to adapt the material, and those bad decisions in turn lead to more tonal inconsistencies. The stuff between Light and Ryuk is supposed-to-be-creepy schlock; the material with Light and Mia plays like one of those movies about twitchy high school misfits who band together and kill everyone in their homeroom; and the rest of it is a bad X-Files episode with a larger budget and some needlessly gratuitous gore. Another problem is the format, and the way the material suffers when stuffed into such a small space. One thing that always subtly annoyed me in the original story was the way the rules of the Death Note itself, and the fact that there were so many of them, constituted a whole box of Get Out Of Jail Free cards. 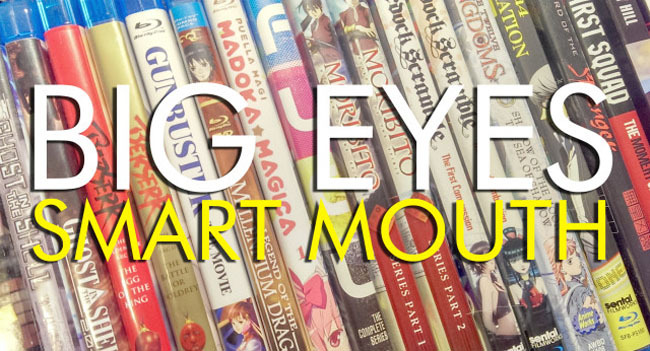 In the space of a TV series or a multi-volume manga, you could make enough room to stretch out and make those kinds of pedantic nitpicks less egregious. They could come to feel less like hand-waves and more like the overall process of the story. Here, with only an hour and a half and change, it feels too often more like the movie is making up rules whenever it’s convenient. Where anything like the original survives, it’s in shards and shreds. There’s an amusing nod to how the original pesud Light picked to publicize his crimes, Kira, can be explained in either Japanese or Western terms, and how Light uses that to throw people off. And there’s Ryuk’s closing line, one anyone peripherally familiar with the original will see coming. But a remake has to be more than just callbacks and winks. At some point it has to stand on its own two feet and walk. Death Note 2017 barely even makes it out of bed. Lost in Translation 223: When is an Adaptation Not an Adaptation?